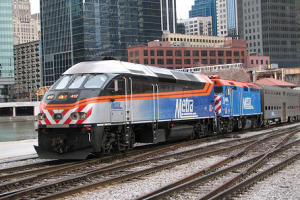 A Metra commuter train is a type of transportation system that takes individuals throughout Chicagoland to their destination. Due to the high use of these commuter trains, it is not uncommon for accidents in the Metra system to occur. In 2011, the Metra was utilized for over 82 million passenger rides. In 2012, the Metra provided over 81.3 million rides. It is clear that the system is a major source of transportation throughout Chicago and surrounding areas. If you were injured on a Metra train, platform or station, contact Rosenfeld Injury Lawyers LLC for a free consultation with an attorney who can advise you of your legal options. Our firm has prosecuted all types of Metra accidents and can help you get the maximum compensation for your injuries. While employees, the police and public agencies are responsible for maintaining a safe environment on the Metra system, there are times when humans make mistakes. All it takes is a few seconds for an employee charged with the security on a Metra system to fail to notice the outbreak of a fight on the train or for employees to fail to notice that the train may be wobbling or running off of the tracks or even take notice of an oncoming train resulting in a crash . Rail safety is critical to the proper functioning of the Metra system, and employees may be liable when there are issues with the system. If you were involved in an accident on the Metra system, then you should get in touch with a Metra train accident lawyer as soon as possible. He or she can begin to investigate the circumstances that lead to the accident in which you were involved. It may just be that an employee was extremely reckless or otherwise careless in the operation of a Metra train. If this is the case, then you may be entitled to receive damages for the injuries that you have suffered. There are also many types of individuals who can be involved in Metra accidents and require representation. When one thinks about the plaintiffs involved in a case surrounding a Metra accident, one may first think of the passengers who are injured. While these individuals surely deserve to receive compensation for being harmed in this accident, there are also others who may deserve compensation. These individuals may include individuals who were boarding or getting off of the train, those waiting for the train at the station, METRA employees harmed while working and those who are walking or driving across the railroad. The Metra train accident attorneys at Rosenfeld Injury Lawyers LLC are ready to represent victims from all backgrounds, and it is in one’s best interest to speak with a lawyer soon after the accident occurs. There can be many causes of Metra accidents involving injury to passengers, employees and drivers / pedestrians at crossings. An engineer may not be adhering to policy and procedure the time of operating the crossing signs and signals for a Metra train. An employee may be distracted while operating the Metra and not notice the speed. These complex accident cases may involve a convergence of factors and require the help of a lawyer who has investigated these types of cases before. It is vital to work with a lawyer who will be able to figure out the cause behind your Metra accident case even when everyone seems to be avoiding liability. In addition to proving that an employee was negligent in operating a Metra commuter train or maintaining its security, a lawyer will also need to prove that you have suffered injuries as a result of the accident. It is important for you to have records that indicate the injuries that you have suffered after a Metra accident. This is why you should meet with a doctor soon after the accident to relay any injuries that you suffered as a result of the accident. The doctor will make notes of the injuries that you suffered, and a lawyer will use these medical notes as proof that you have a claim for damages. The damages that you ultimately request in your Metra case may entail pain and suffering, medical expenses, loss of consortium or lost wages. Some people suffer from concussions or fractured limbs that make it impossible to return to work after a Metra collision. You can call a lawyer today to receive an estimate of the damages that you may be able to receive for your case. Get the legal help that you need by calling one of our Metra accident attorneys at Rosenfeld Injury Lawyers LLC today. You deserve to have your claim represented, and our lawyers are here to aggressively pursue your claim to ensure that you get every dollar that the law entitles you to. We understand what it takes to win compensation for those who have suffered injuries in Metra accidents. Call us today to schedule an initial consultation for your legal claim.